Most tea aficionados know that all tea comes from the same source: the Camilla Sinensis tea bush. Whether a tea leaf winds up in a cup of green, black, or oolong tea depends entirely on what happened after it has been plucked from the plant. This means the various kinds of tea available really depend on the methods of the tea-making process. Black tea, for example, gets its dark color and full flavor from a complex fermentation process that includes exposing crushed tea leaves to air for a strictly defined amount of time. Green tea, on the other hand, isn't fermented at all, but merely withered in hot air and quickly steamed or pan-fried; a gentle rolling and a final heating stabilize the tea’s natural flavors. Oolong tea falls somewhere in the middle—it’s partly fermented which gives it a reddish color and a “flowery” flavor. So where does white tea fit into the greater tea picture? White tea comes from the fine silvery-white hairs on the unopened buds of the tea plant (some people simply describe this as the “hair” of the immature tea leaves). White tea usually requires only minimal processing: the immature leaves from the tea bush are plucked fresh and the tea leaves are withered by air-drying, solar-drying, or mechanical drying. Then you are left with white tea. The white tea beverage itself is not white or colorless but instead has a slightly yellow or very pale yellow color. Its flavor is very mild compared to black tea and green tea and is sometimes described as sweet and silky. White tea lacks the “grassy” aftertaste so often associated with green tea, which has a much stronger taste than white tea. Chinese tea drinkers have known about white tea’s benefits since the Ming Dynasty. 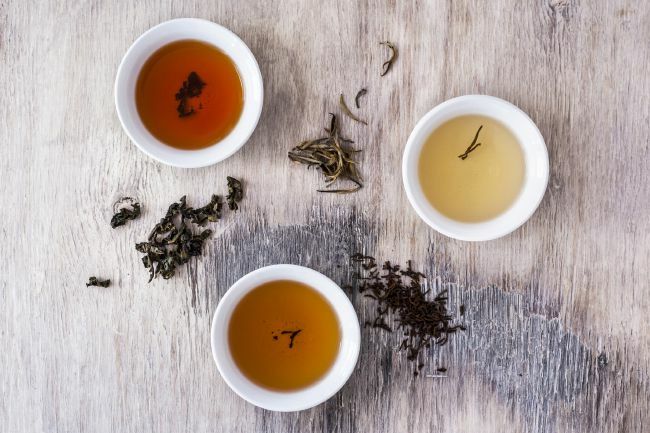 Today, everyone from chefs to medical researchers praise white tea’s flavor and its purported health benefits, which is why we have seen white tea products hit the store shelves as well as find a place on drink menus. White tea contains a high amount of antioxidants, as well as polyphenols, flavonoids, and tannins. These nutritional benefits have a positive effect on our health and well being. White tea has been shown to protect the body against certain diseases and reduce the risk of cancer and cardiovascular disorders. It also provides natural antibacterial properties, helps with weight loss, and can lower bad cholesterol. Some studies suggest that white tea may increase the antioxidant effects of your bodily organs as well as increase your plasma. Because of the high percentage of antioxidant properties, white tea can also help to repair and maintain your skin and protect the skin against the effects of ultraviolet light. This light beverage also can slow down the aging process and reduce the risk of premature aging. Because the color of white tea is a lot lighter than black tea and green tea, it won't stain your teeth. Even better, it has been proven that white tea can help to reduce the risk of dental decay or cavities. Some study results suggest white tea can also have a positive effect on diabetes. White tea may provide some kind of relief from diabetic symptoms and decrease your plasma glucose levels and increase insulin secretion.